Image of the Suspended plate (punched-out & folded version). 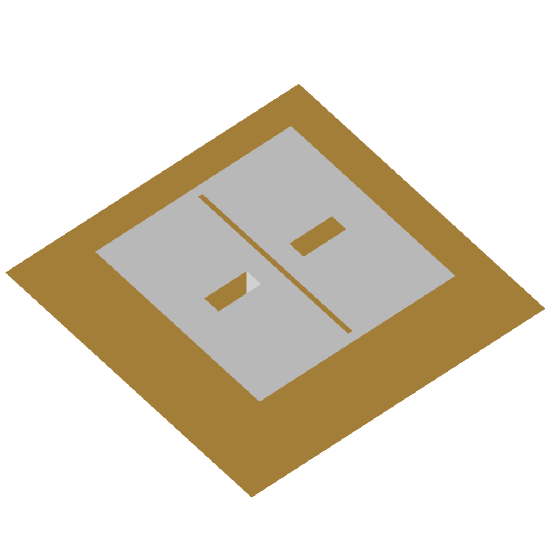 The suspended plate antenna (SPA) is a variation on the microstrip patch antenna, where the dielectric is usually air or a low relative permittivity substrate, and the height of the plate above the ground plane is greater than that of a conventional patch. When the substrate height of a pin-fed SPA is increased to improve bandwidth, the inductance of the feed pin begins to dominate the input impedance. A number of schemes have been proposed which reduce this effect by using matching sections or series capacitors. However, some of these feeding schemes may generate undesirable radiation patterns and high levels of cross-polarised radiation. Enforcing symmetry by exciting the plate with two feeds, 180 °s out of phase, can mitigate these effects. However, this requires the complexity of a 180 ° hybrid. This requirement is done away with by Chen, Z. N. and Chia, M. Y. W. by cutting a central slot in the plate, driving one of the slot edges, and shorting the other to ground. The feed-pin inductance can be compensated for by increasing the slot length [Chen and Chia, Fig. 6a and 6b] .